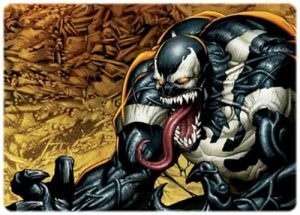 Today on Marvel Trading Cards we’re going to look at the Origin History of Venom, one of my favourite villains. 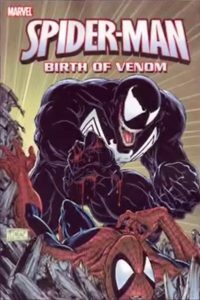 The Origin History of Venom begins with the creature that would become Venom being born to a race of extra-terrestrial symbiotes which lived by possessing the bodies of other life-forms. These parasites would empower their victims with superior physical abilities at the cost of fatally draining them of adrenaline. 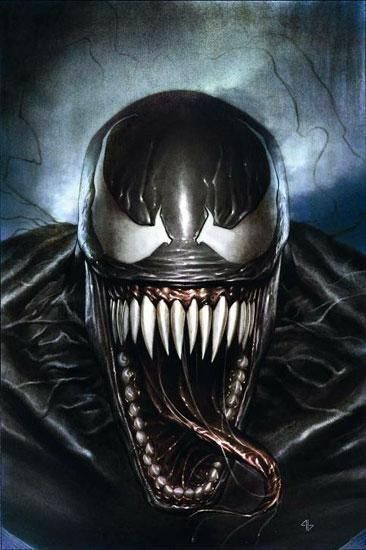 According to the Planet of the Symbiotes storyline, the Venom symbiote was deemed insane by its own race after it was discovered that it desired to commit to its hosts rather than use it up. The symbiote was then captured and imprisoned on BattleWorld to make sure that it did not pollute the species gene pool. In Secret Wars issue #8, Spider-Man damages his costume in combat on BattleWorld and is directed to a facility that can provide a new one to him. 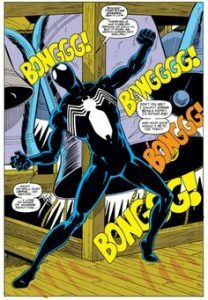 Before having the opportunity to get a new suit, Spider-Man stumbles into the incarceration module where the symbiote was being held, he then activates the machine which releases the symbiote in the form of a black liquid. Spider-Man’s spider-sense initially tingles (warning him of danger) and then stops upon Spider-Man’s first contact with the liquid. It covers his body and reacting to Spider-Man’s thoughts about the costume worn by Julia Carpenter (the second Spider Woman), which was a black & white suit, a new costume and symbol are formed for Spider-Man. To Spider-Man surprise the costume was also able to mimic street clothes and provide a seemingly endless stronger supply of webbing. 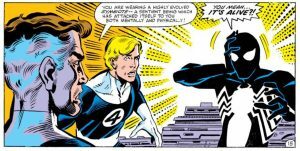 Once back on earth Spider-Man enjoys the costumes convenience and style but soon realises with the help of Reed Richards of the Fantastic Four, the costume is an alien symbiote that wants to fuse permanently with him. In a desperate attempt to rid himself of the symbiote, Spider-Man crashes himself into a church bell tower. As the bells ring to sound the hour the symbiote is weakened by the sound and it detaches itself from Peter’s body. In an act of sympathy however the symbiote uses its remaining strength to carry an unconscious Peter Parker to safety from the bell tower before it slithers away. Spider-Man, believing the symbiote to be dead, created an alternate homemade version of the black suit and began wearing it in conjunction with his original. Spider-Man’s rejection to the symbiote would later leave it bitter and wanting to kill him, a trait is shared with its future host Eddie Brock. 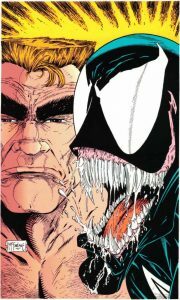 Eddie Brock was the first person to become Venom and by far my favourite Venom. Eddie was a reporter for The Daily Globe before it comes to light that he had fabricated a story revealing the identity of the Sin-Eater. Shortly after the story was published Spider-Man pursued and captured the real Sin-Eater disgracing Brock as a news reporter and costing him his job and then his wife. 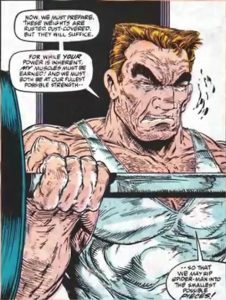 Now writing for a cheap gossip magazines, Brock has bitter hate for Spider-Man which only escalates when it’s revealed that Brock has cancer, in response to this news Brock begins working out bringing his body to peak physical fitness. Still unable to cope with this misfortune, Brock contemplates suicide and goes to a church to pray for forgiveness. Meanwhile the symbiote, having recovered in eating another human host, in order to survive, finds itself physically attracted to Brock for both his increased adrenaline and mutual hatred for Spider-Man and BOOM… Eddie Brock – Venom was born and made his first appearance in the very last panel of The Amazing Spiderman issue #299 but was shown in issue #298 of The Amazing Spider-Man as a silhouette saying “we will get Spider-Man very soon”. 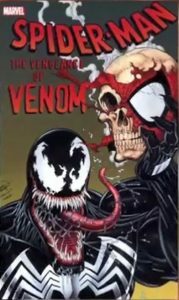 The original idea for Venom came from Randy Schueller, a regular reader of Marvel Comics and was bought by Marvel for $220 under the direction of the then editor-in-chief Jim shooter. The designs of the costume for the character came from Mike Zack and Todd McFarlane. Now even though Eddie Brock is the most popular Venom, there have been several different people to don the Venom mantle over the years, but I’m just going to mention two of the most notable ones besides Eddie Brock. The first one being Mac Gargan aka Scorpion: After abandoning its previous host the Venom symbiote approached Mac Gargan and offered him additional powers he agreed and became the next host of the Venom symbiote which he hoped would give him the advantage he needed to defeating Spider-Man as well as securing a place as a part of the Sinister 12, however with the help of other heroes he was still defeated by Spider-Man. 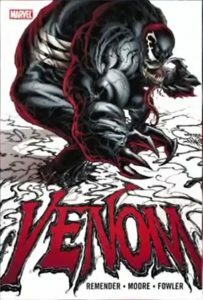 You have the second most recent Venom Flash Thompson: During the Siege of Asgard, Mac Gargan is separated from the Venom symbiote, the symbiote then falls into the possession of the US government and was contained in a secret government base, controlled by the Department of Homeland Security. The DHS was inclined to use the symbiote to create a new super-powered soldier to help them protect the country. After trying and failing to bond the symbiote with another host resulting in the candidate’s death the government decided to approach another candidate. Around this time Flash was approached by the department of homeland security as a candidate to be bonded with the parasite alien in order to create a new super soldier. 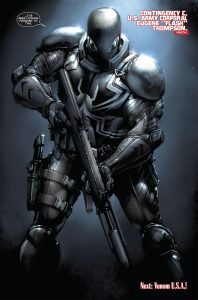 Flash agreed to the experiment and became Agent Venom, controlling the suits sentient behaviour with a combination of sedatives and his own strength of will. Now the die-hard Spider-Man and Venom fans are probably like, you haven’t mentioned Eddie Brock’s returned as Venom in the form of Anti-Venom, but hey, don’t worry, we’re going to cove that. Once again while praying at a church, Brock was discovered by Martin Lee who was secretly Mr Negative. After Matt Murdock proves in a court of law that Brock was not responsible for his actions while bonded to the symbiote and has Eddie’s charges dropped, Lee gets Brock a job at his soup kitchen. Eddie begins life as a cook and continues rounds of chemotherapy in order to try to combat his cancer. 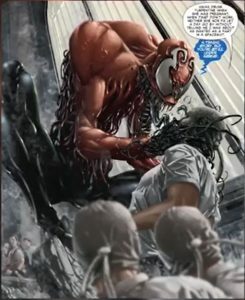 Eddie believed his cancer was terminal and would kill him soon, when a touch from Mr Negative charged the remnants of the Venom symbiote within his body and activated them, causing them to bond to his white blood cells. 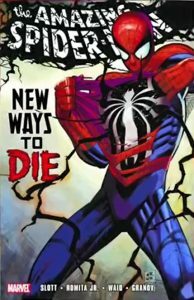 This created a brand new non-sentient symbiote that lived within Eddie’s bloodstream secretly healing his body of cancer. One day Mac Gargan who was the current Venom, was hunting Spider-Man, but he senses a former host and presuming it to be Spider-Man followed his sense only to encounter Brock instead of Spider-Man. 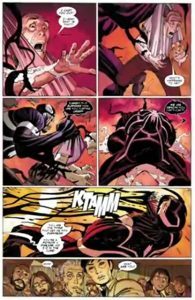 The Venom symbiote then attempts to leave Mac Gargan to re-bond with Brock, however upon making contact with Brock’s skin the new symbiote in his blood began to react and a white substance seeps out of his pores and the Venom symbiote is immediately repelled. 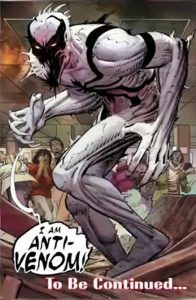 Once the new symbiote completely covers Brocks body and transforms his appearance, Brock declares himself as Anti-Venom. Now I couldn’t write a Venom post without at least mentioning Venom’s offspring Carnage. 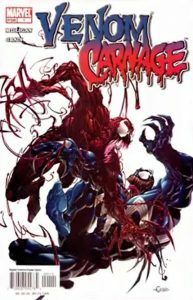 I’m not going to get into detail about him since he has his own post that explain everything, but in short Carnage is the child of Venom, now you may be asking does that mean Venom got it on with someone…? NO…! It doesn’t… get your minds out of the gutter. Symbiotes reproduce asexually once per generation. 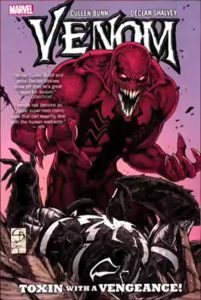 Once born, the offspring of Venom bonded with the insane serial killer Cletus Kasady to become Carnage, thus creating one of Spider-Man’s most dangerous, brutal and deadly villains. You also have Toxin who is the symbiote son of Carnage and the grandson of Venom. These are just a couple of good Venom stories to get you started. Well I hope you enjoyed this Post. Please visit our Facebook page and give it a Thumbs Up by clicking the Like Button. You can also follow us on Instagram keep up with all things Marvel Cards related and I’ll see you guys on the next Post.